^ 1.0 1.1 1.2 1.3 1.4 1.5 1.6 RSMC Best Track Data: 1990–1999 (TXT). Japan Meteorological Agency. 1992-12-25 [2014-01-18]. （原始内容存档于2013-01-22）. ^ Joint Typhoon Warning Center Mission Statement. Joint Typhoon Warning Center. 2011 [2011-11-30]. （原始内容存档于2009-08-12）. ^ 3.00 3.01 3.02 3.03 3.04 3.05 3.06 3.07 3.08 3.09 3.10 3.11 3.12 3.13 3.14 3.15 3.16 1992 Annual Tropical Cyclone Report (PDF). Joint Typhoon Warning Center: 146–150. [2011-11-28]. （原始内容 (PDF)存档于2013-02-21）. 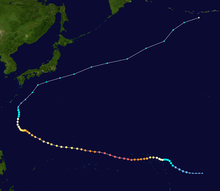 ^ Annual Report on Activities of the RSMC Tokyo – Typhoon Center 2000 (PDF). Japan Meteorological Agency: 3. 2001-02 [2014-01-18]. （原始内容存档 (PDF)于2013-12-12）. ^ 5.0 5.1 Best Track Data for Typhoon Gay (31W) (TXT). Joint Typhoon Warning Center. 2011-04-05 [2014-01-18]. （原始内容存档于2013-10-04）. ^ Susan Atkinson, at 49; author and sailor caught in typhoon. Boston Globe. 1992-12-02 [2014-01-18]. ^ Guam, Northern Marianas Brace for Super Typhoon Gay. The Item. Associated Press. 1992-11-22 [2014-01-18]. ^ Typhoon Gay Blows Ashore in Guam. The Deseret News. 1992-11-23 [2014-01-18]. （原始内容存档于2014-01-18）. ^ Alexander M. Kerr. Defoliation of an island (Guam, Mariana Archipelago, Western Pacific Ocean) following a saltspray-laden 'dry' typhoon (PDF). Journal of Tropical Ecology (Guam Marine Lab). 2000, 16 (6): 895–901 [2011-12-04]. （原始内容 (PDF)存档于2012-10-24）. ^ Guam Office of Civil Defense. Risk Assessment. 2011 Guam Hazard Mitigation Plan (PDF). URS Corporation. 2011. section 5, p. 37 [2014-01-18]. （原始内容 (PDF)存档于2013-07-27）. ^ Typhoon passes over Guam. The Daily News. Associated Press. 1992-11-23 [2014-01-18]. ^ Weather Disaster Report (1992-936-13). Digital Typhoon. [2014-01-19]. 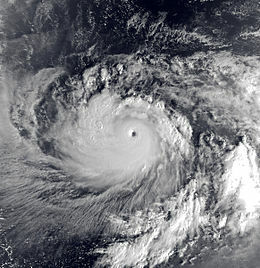 ^ Marshall Islands Typhoon Gay. Federal Emergency Management Agency. 2004-10-18 [2012-01-06]. （原始内容存档于2012-01-06）. ^ Compacts of Free Association: Micronesia and the Marshall Islands Face Challenges in Planning for Sustainability, Measuring Progress, and Ensuring Accountability (PDF). United States Government Accountability Office. appendix II, p. 70. 2006-12 [2014-01-19]. （原始内容存档 (PDF)于2012-09-05）. ^ Project Completion Report of the Emergency Typhoon Rehabilitation Assistance Program Loan and Technical Assistance Completion Report on Disaster Mitigation and Management (PDF). Asian Development Bank. basic data, pp. ii–vi; section II, pp. 1–4; section IV, p. 8; appendix 1. 1994-11 [2014-01-19]. （原始内容 (PDF)存档于2014-01-18）. ^ Peter Ada; Hideo Kobayashi, President of Japan Guam Travel Association. Testimony of Hideo Kobayashi President, JGTA on Bill Numbers 588 and 589 (PDF) (Transcript). A collection of written testimonies on Bill Numbers 588 and 589 to the Committee on Tourism and Transportation of the Twenty-Second Guam Legislature. Guam Legislature. PDF p. 4. 1993-08 [2014-01-19]. （原始内容存档 (PDF)于2012-04-22）. ^ Mission. Guam Communications Network. [2011-12-05]. （原始内容存档于2012-02-10）. ^ Karl Hoarau, Gary Padgett, and Jean-Paul Hoarau. Have there been any typhoons stronger than Super Typhoon Tip? (PDF). 26th Conference on Hurricanes and Tropical Meteorology. Miami, Florida: American Meteorological Society. 2004 [2011-12-05]. （原始内容存档 (PDF)于2013-11-09）.